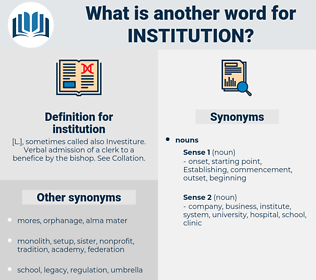 What is another word for institution? [ L.], sometimes called also Investiture. Verbal admission of a clerk to a benefice by the bishop. See Collation. Criteria, NGOS, requirements, Trustees, Operators, Narcotics, directors, remarks, officers, CRS, institutional, foundation, Foundations, institut, facility, Facilities. affiliations, accommodations, determinations, Penitentiaries, Trustees, Facilities. Ais, instrumentality, instrument, foundation, re-education, installation, facility, location, Fora, set-up, formulation, museum. implemented, identified, completed, Depended, Appeared, produced, added, prepared, made. Incarcerated, Compiled, finalised, Drafted, finalized, formed, capped, prepared, drawn, landed, institutionalized. Pardee's dinners became an institution in Okoochee.
" I don't feel like - a permanent institution," she told him rather piteously. orphanage, penal facility, penal institution, orphans' asylum, rest home, home, nursing home. 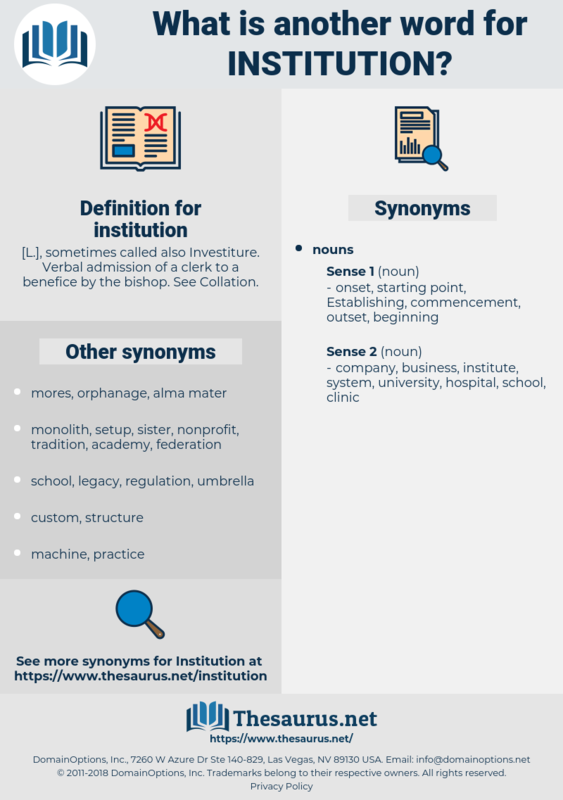 financial institution, academy, organized religion, honorary society, issuer, faith, educational institution, vicarship, financial organization, medical institution, company, religion, Financial Organisation, vicariate, charity.